To fulfill this mission, the MRC engages in both standards-setting activities and in conducting independent audits with third-party CPA firms in order to confirm compliance with such standards. Companies that have achieved compliance with a standard are certified as MRC-compliant for that specific standard. Pixalate is launching an ongoing series of articles which will unpack some of the inside baseball as it relates to the MRC's standards and processes for validating effective and reliable audience measurement. Our series begins today with display ad impression viewability. In the late 2000s, various online advertising industry groups and some major players began to acknowledge an obvious drawback in the current state of the art in online advertising impression measurement. Ads — whether images, rich media, or other content — are downloaded to the page when the page loads, or when it refreshes, regardless of whether the portion of the page they are on is visible. Advertisers were, therefore, paying for filled impressions — e.g. sold ad spaces — with no clue whether those ads actually had the opportunity to be seen by a human. What followed was a period of several years in which various viewable impression technologies and payment models entered the market. Several measurement standards were considered, until in early 2014, the MRC — in conjunction with the IAB — finalized their standard for viewable ads. than or equal to one continuous second, post ad render. Additionally, all such viewable ads must themselves be valid ad impressions before the viewability standard is applied. Ad impressions resulting from non-human activity, ad fraud, out of focus or obstructed pages, and significant auto-refresh activity are also considered not viewable. The consistent application of the MRC viewability standard by measurement firms, buyers, and sellers has effectively reduced advertiser uncertainty in the programmatic advertising landscape. 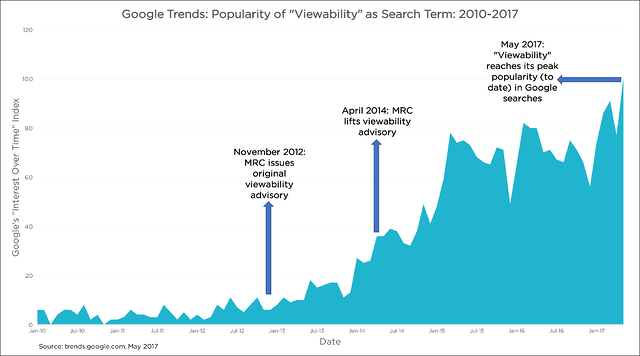 Interest in viewability has increased over the years. Buyers and sellers are now entering into viewable-only contracts, in which non-viewable impressions are discounted from the ultimate payment. Private marketplaces have been created where only currently in-view ad opportunities are offered, and historical viewability percentages for sites, pages, and ad placements are taken into consideration by automated buying programs when deciding how much to bid. As an MRC-accredited viewability vendor, Pixalate can provide the necessary data to fuel any number of viewability-based transactions entered into by parties in the advertising supply chain. And our Global Seller Trust Index (GSTI) leverages the viewability of ads sold as a key metric when scoring the overall trust of programmatic advertising sellers.